According to the U.S. Department of Transportation, there are about 8.5 million registered motorcycles on the road in the United States as of 2012. Driving a motorcycle is appealing for many reasons, such as the versatility and lower costs, and the freedom and fun of riding one. 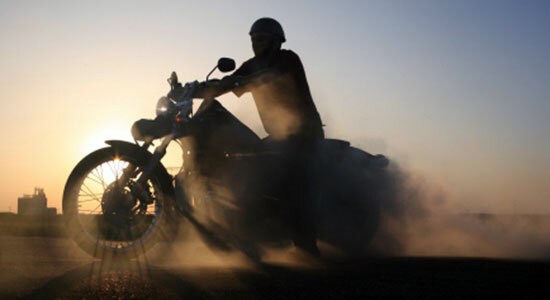 While owning a motorcycle comes with many advantages, keep in mind that there are also serious safety risks involved. Motorcyclists face more threats on the road than most drivers, and they are especially vulnerable when faced with drivers who are negligent, unaware, or unwilling to share the road. It is important that all motorcyclists, and drivers who are on the road with them, are aware of the threat of motorcycle accidents. We hope that the motorcycle accident statistics we've compiled will prepare you for the dangers of the road in order to avoid any future accidents. PA motorcycle accidents make up only 2.7 percent of total crashes, but 17.4 percent of total fatalities. In 2016, total motorcycle crashes increased 1.2 percent from 2015 while fatal motorcycle crashes increased 7.3 percent from 2015. Of the 192 fatalities in 2016 involving motorcycle drivers or passengers, 174 (90.6 percent) were drivers and 18 (9.4 percent) were passengers. Only 4 percent of total motorcyclists wearing helmets suffered fatal injuries. Of riders not wearing helmets, 6.4 percent were killed in crashes. Nationwide, helmets saved the lives of 1,859 motorcyclists of all ages in 2016, according to NHTSA estimates. An additional 802 lives could have been saved if all motorcyclists had worn helmets. Motorcyclist fatalities increased by 257 (5.1 percent), the largest number of fatalities since 2008. In 2014, there were 3,284 motorcycle accidents. 186 of these accidents were fatal. 173 deaths were drivers, while 13 were passengers. Total motorcycle accidents decreased by 4.2% from 2013. Fatal motorcyle accidents rose 5.1% from 2013. Of those deaths, 53.2% of riders were not wearing a helemt. There are more single vehicle motorcycle accident claims than rear-end, intersection, and unrecovered combined. Summer was the most common time for an accident. July specifically had the most accident claims. For more yearly statistics of Pennsylvania motorcycle accidents, visits PennDot's website for their Crash Facts and Statistic Books. Injured in a Motorcycle Wreck? Call Us Now! We have a history of helping injured motorcyclists. Since 1982, we've been recovering compensation for our injured motorcycle clients and protecting their legal rights. As bikers, it's dangerous when other motorists don't share the road. It can lead to accidents that cause serious, lasting injuries that can change your life forever. We can help put your life back on track. Call our legal professionals at 1-866-943-3427 or simply fill out our free legal consultation in the top right corner of this page. We'll review your case for free, and there's absolutely no obligation to use our services. We can answer your legal questions and determine the best options for your case. "There's Never a Fee" – That's Our Guarantee! It won't cost you anything to call us. If you hire our attorneys, we'll cover all your upfront costs, we'll keep the insurance companies from pushing you around, and we'll fight to get you the maximum amount of money you deserve. If we don't win your case, you won't pay us anything. That's our guarantee. Don't hesitate. Call us now. "Traffic Safety Facts 2016" NHTSA. Motorcycle Crashes" by the Insurance Information Institute.